Want a super-fast recipe for Parmesan potatoes? 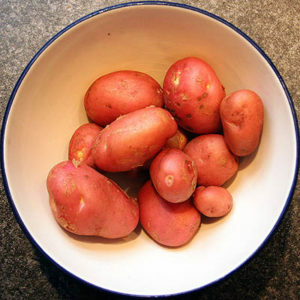 Throw unpeeled red potatoes, cut in quarters, into a big pot of water and boil until the potatoes are fork-tender, about 12 minutes. Drain them, put them back in the same empty pot, add 3/4 cup of olive oil, salt, pepper and a cup of freshly grated Parmesan cheese. Stir until the cheese melts. Anyone can make this easy, irresistible recipe. And wow, do kids like it.